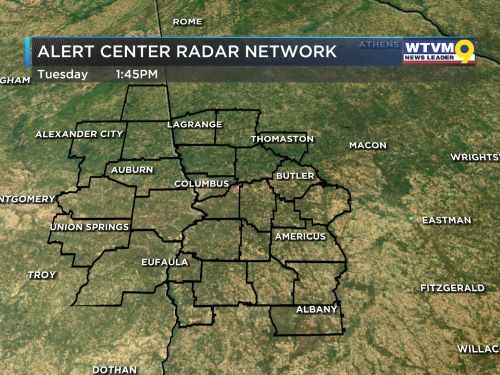 COLUMBUS, GA (WTVM) - Temperatures won't be dropping much tonight with most spots in the upper 40s and lower 50s by early Wednesday morning - a lot warmer than the past couple of nights. Clouds will stick around, and although we might see a shower, most will stay dry tonight and early Wednesday. Rain and perhaps a few storms will become likely after 5 PM tomorrow, heading into Wednesday night. The rain may be heavy at times, and conditions will stay fairly windy through the day as well. We may deal with some lingering showers early Thursday, but skies will turn sunny by the afternoon with windy and colder conditions building back in - look for highs in the upper 40s and lowe4 50s. Ending the week and heading into the weekend we’ll have some clouds and sun along the way with temperatures mainly in the upper 40s and lower 50s on Friday with 50s by Saturday and Sunday. Our next system we’re watching will increase clouds early next week and provide some rain on Tuesday. That will lead to another shot of very cold air to end the month of January. Derek Kinkade joined Storm Team 9 in July 2006 and became Chief Meteorologist in 2011. His hometown is Rainbow City, AL, in the northeast part of the state. We're tracking a batch of rain and storms to the west of us which will be moving in later this evening and tonight. We don't anticipate major concerns with severe weather since most of the energy for these storms will be well down to our south. Rain chances return to the forecast for Thursday but hold off until the evening hours. Warm spring weather sticking around!